Backed by French helicopters and paratroopers, Malian soldiers entered the fabled city of Timbuktu on Monday after al-Qaeda-linked militants who ruled the outpost by fear for nearly 10 months fled into the desert, setting fire to a library that held thousands of manuscripts dating to the Middle Ages. Still, there was celebration among the thousands of Timbuktu residents who fled the city rather than live under strict and pitiless Islamic rule and the dire poverty that worsened after the tourist industry was destroyed. "In the heart of people from northern Mali, it's a relief — freedom finally," said Cheick Sormoye, a Timbuktu resident who fled to Bamako, the capital. Timbuktu, a city of mud-walled buildings and 50,000 people, was for centuries a seat of Islamic learning and a major trading centre along the North African caravan routes that carried slaves, gold and salt. In Europe, legend had it that it was a city of gold. Today, its name is synonymous to many with the ends of the earth. Michael Covitt, chairman of the Malian Manuscript Foundation, called the arson a "desecration to humanity." "These manuscripts are irreplaceable. They have the wisdom of the ages and it's the most important find since the Dead Sea Scrolls," he said. Just over two weeks after the French began their military intervention in Mali, French and Malian forces arrived in Timbuktu overnight, the French military spokesman said Monday. "The helicopters have been decisive," Burkhard said, describing how they aided the ground forces who came from the south as French paratroopers landed north of the city. But the French have said Mali's military must finish the job of securing Timbuktu. And the Malians have generally fared poorly in combat, often retreating in panic in the face of well-armed, battle-hardened Islamists. "It's truly alarming that this has happened," Mayor Ousmane Halle said by telephone from Bamako. "They torched all the important ancient manuscripts. The ancient books of geography and science. It is the history of Timbuktu, of its people." "UNESCO is very concerned about the reports coming out of Timbuktu as to damage on cultural heritage there," UNESCO chief spokeswoman Sue Williams said from Paris. The destruction recalls tactics used by the Taliban in 2001 when a pair of giant Buddhas carved into a mountain in Afghanistan were damaged by dynamite. The Taliban also rampaged through the national museum, smashing any art depicting the human form, considered idolatrous under their hardline interpretation of Islam. In all, about 2,500 statues were destroyed. 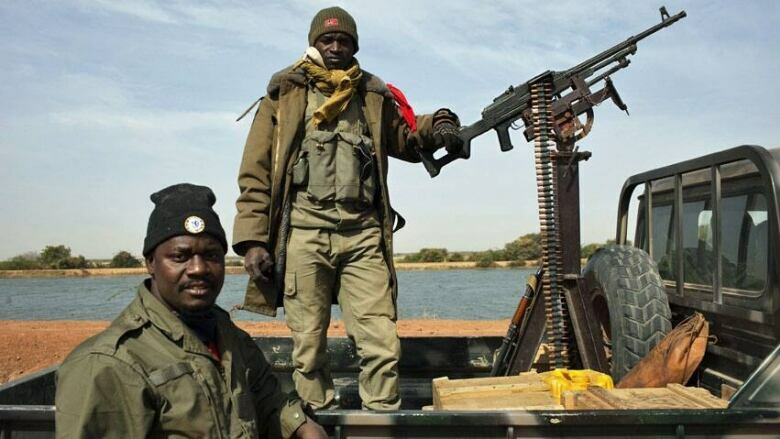 Mali's Islamists still control the provincial capital of Kidal farther north and are believed to have dug a network of tunnels, trenches and caves from which they can launch attacks. Nana Toure, a native of Timbuktu now living in the capital, said she was delighted to hear that the French had arrived but worried how long the Malian soldiers could hold the town without help. "French troops must not leave us alone then, because those who fled may come back and cause problems for us," she said. "French troops have to stay a bit to stabilize the place."